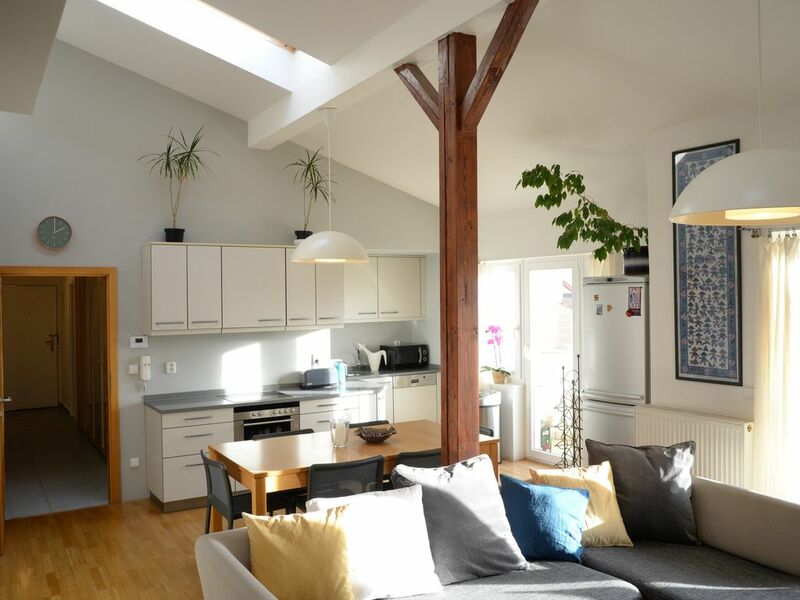 Sunny attic apartment with an area of 90 m2 with 15m2 terrace located in a house with an elevator and a stunning view of the Vítezné námestí (Dejvická metro station). This location’s is convenient and authentic. With the easy metro/ bus ride to the airport and plenty of tram or metro connections to take you downtown, getting around couldn’t be easier. Our apartment is 5 minutes walk from Dejvicka metro station, 1 stop to Prague castle & 3 stops to city centre. Just outside the city centre, a fusion of high rise apartments and embassies lend this area a laid back, local feel. But don’t fret; the delights of Staré Město are an easy tram or metro ride away. You can also walk into town in about 30 minutes. On your way you can see the entire city from the expansive Letná Park. Pull up a seat at one of the park’s beer gardens and raise a Budvar to the magic of Prague. Or you can walk to Prague castle which will take you only 15 minutes. Baroque townhouses accommodate booted n’ suited public servants and diplomats in Bubeneč, who make for district’s myriad of local bars and restaurants at lunchtime. It's a great neighbourhood. 2 nice kids parks close by and two of the largest parks in the city (Letna and Stromovka) are less than 1 mile/1.6km away. The restaurants and pubs are friendly with a good variety of cuisine from around the world. And when you are indoors you can relax. Your apartment is modern, comfy and homely. And the terrace is a real plus. From your terrace you can see monitored parking lot in Verdunska street (CZK 150 for 24 hours at the time of writing). Since 2016 only residents can park free of charge (blue zone). The standard check-in time is from 15:00 and the check-out by 10:00. For a late check-in after 20:00 or an early check-out before 08:00 there is an extra cost of £20. Final cleaning fee at £45 is included in your booking. This place was amazing....super clean, great location and apartment has everything you need. You can walk to all the major sites. Great park nearby for running. Ivana and Pepe were great to work with...we had several airline issues and they were extremely accommodating. I would recommend to anyone coming to stay in Prague! We will be back! Just like the photos, and very convenient. We really enjoyed our stay in this lovely appartment ; it was very well equipped and located. Every thing was perfect , there are many shops and restaurant around . The appart is very quiet and old city is close and it is possible to go there by foot.